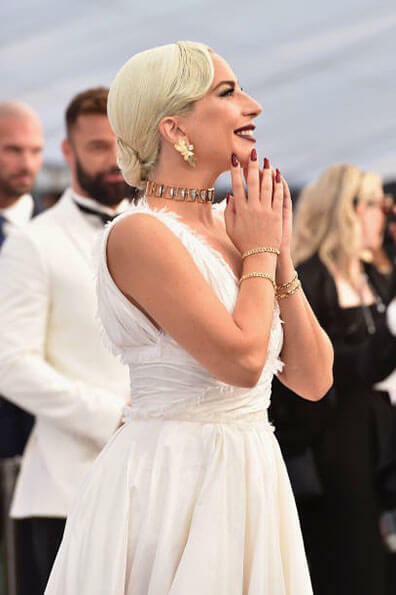 Gaga’s elegant updo was inspired by a timeless ballerina bun, her bright, blonde hair swept away from her face. • Use Joico Defy Damage Protective Shampoo and Conditioner to maintain the color and strength of the hair, by gently cleansing and protecting against past, current, and potential future damage. “I love the results of these two products, because the hair is left shinier and softer with each use,” says Frederic. • Add 2 to 3 pumps of Joico Defy Damage Protective Shield throughout towel-dried hair. • Apply Joico Blonde Life Brilliant Tone Violet Smoothing Foam to create smooth, soft bounce, and to tone out unwanted brass, keeping cool blondes cool. • Use a detangling comb to evenly distribute the product and untangle hair. • To create the perfect blowout, start from the bottom and blow dry downwards using a paddle brush – this creates a smooth, frizz-free finish. • Spray Joico Flip Turn Volumizing Finishing Spray onto an oval dressing brush, as you brush hair up into a low ponytail to achieve a smooth, controlled finish on the side and back of hair. • Secure with an elastic. • Spray Joico Ironclad Thermal Protectant Spray lightly throughout. • Wrap the loose strands of hair in the ponytail around a curling wand to define and give ends a feminine curl. 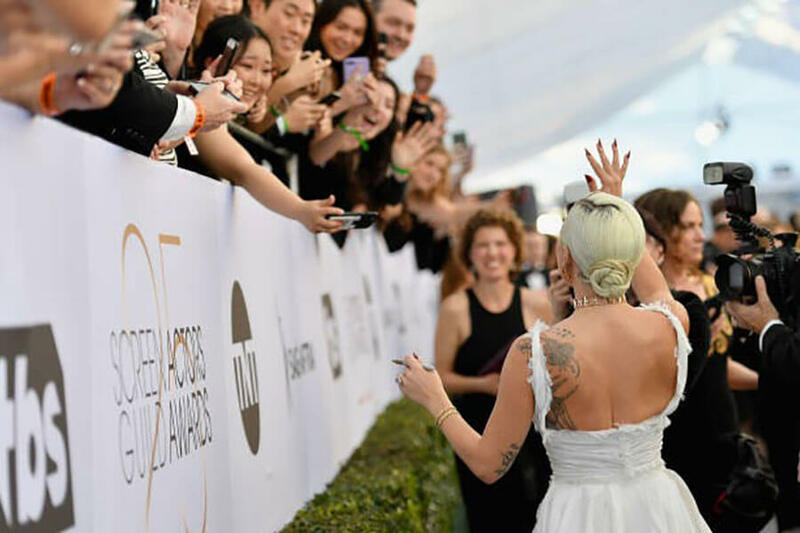 • Spray Joico Hair Shake Finishing Texturizer Spray on the hair and onto a narrow dressing brush; molding a flat ballerina bun at the base of the head. • Finish with Joico JoiFix Finishing Spray for long-lasting, strong hold and shine. Ok, so she might have been unprepared with a speech, but she was anything but unprepared in the style department. 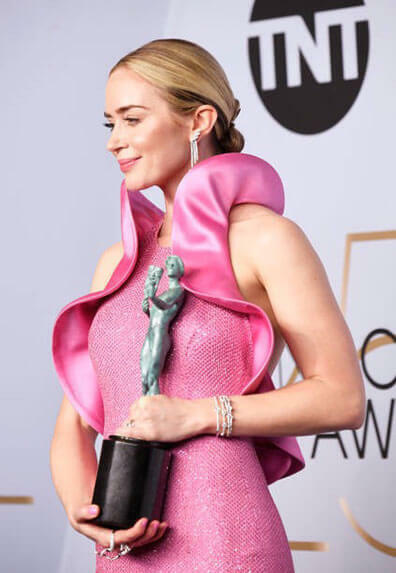 As one reviewer described it, “Emily Blunt’s hair was business in the front, party in the back.” And what a party it was: With a show-stopping Lelet NY barrette accessorizing her gleaming chignon, the look was frankly… beautiful. Treat the hair to make strands strong and appear 2X shinier by applying Luster Lock Instant Shine & Repair Treatment and allowing it to penetrate for 5 minutes before styling. • Blow-dry wet hair using a soft brush to get strands as straight and shiny as possible. • Add a center part, and pull hair into a slick pony, keeping it as low to the nape as you can. Secure with a hair band. • Spray the pony with Joico Beach Shake Texturizer Spray to add fullness and waves. • Now spray Beach Shake on flyaways. • Roll the pony into the nape and secure with a barrette. • Set with additional Beach Shake for a high-gloss finish.